Case Study | Toon Boom Animation, Inc.
We have about 20 product versions and modules, and we have different skins for all of them. I really appreciate the power and flexibility of setting up different skins using targets in Flare. Efficiency - Flare’s topic-based single-source, multi-channel publishing streamlines delivery of online and print documentation for 20 product versions and modules. Builds in the background speed weekly updates to content. Easy Customization - Conditional tags, TOCs, snippets, and skins in Flare enable Toon Boom to customize content, as well as the look and feel, for different versions of its documentation. Collaboration - Integration between Flare and Apache SVN allows multiple writers to develop content for the same project at the same time. Intuitive User Experience - Top navigation and responsive design provide a modern, intuitive Web experience for desktop and mobile users, and enhance SEO. Drop-down text in online documentation helps readers get to the topics with collapsed content they need faster. Give customers the option to choose view documentation via PDF files or HTML5 Web output. Streamline the process of creating and updating online and print documentation for different targets through content re-use. Create Web documentation that is more responsive, intuitive and appealing for users, regardless of the computer or mobile device being used to access it. Enable multiple authors to work on a single project simultaneously without losing content. Extend branding to documentation for different product versions through the use of different skins. Toon Boom Animation, Inc. delivers award-winning software that has set a global standard for 2D animation and storyboarding for film, television, Web animation, games, mobile devices, training applications and education. Headquartered in Montreal, the company counts Walt Disney Animation®, Rovio Entertainment®, Universal Studios®, Nelvana®, and 20th Century Fox Animation® as some of the customers. For the past 20 years, Toon Boom has changed the animation world one production at a time by setting a standard of excellence and aiding in the development of the world’s finest animated productions. 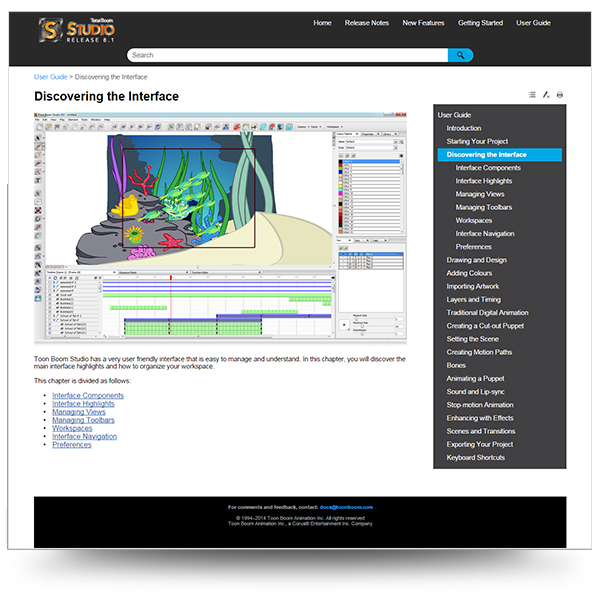 This includes not only Toon Boom animation software and guides on how to use its products, but also documentation on animation industry best practices. Using MadCap Flare, Toon Boom is able to provide information to users both as PDF files and online Help, enabling customers to obtain the guidance they need in their format of choice. 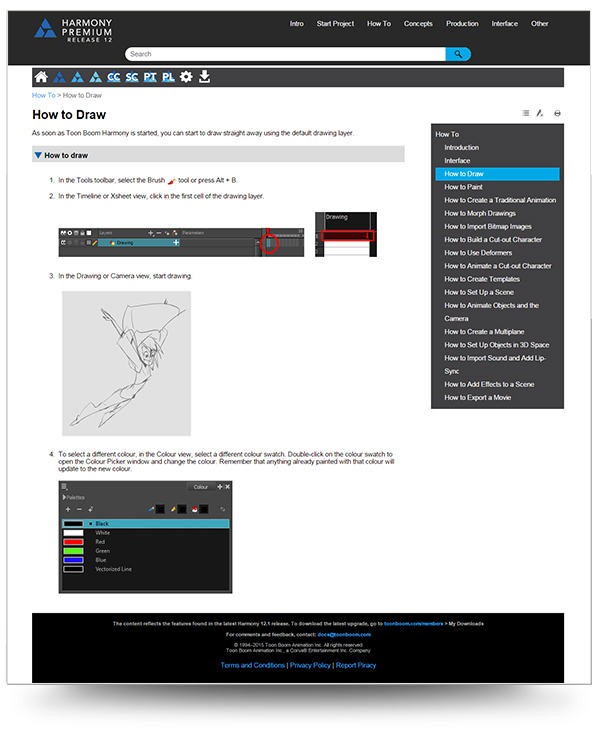 For years, Toon Boom has created guidebooks that provide both the technical documentation and guidance on how to implement it into the production workflow. Originally, Toon Boom relied on Adobe® FrameMaker® to create the books. However, the process was time-consuming. Moreover, the company was interested in adding online documentation, which FrameMaker® was not designed to handle on its own. With an eye on modernizing its approach to print documentation and adding online Help, Toon Boom began looking at single-source publishing tools on the market, and the search quickly led to MadCap Flare. 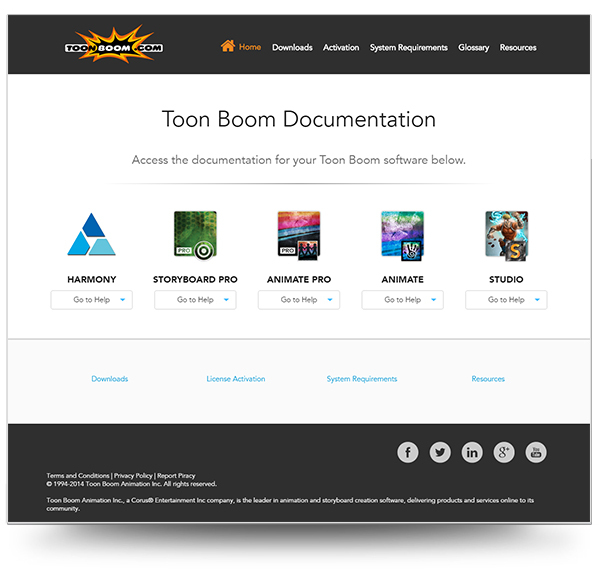 For more than two years, Toon Boom has relied on MadCap Flare’s topic-based authoring and single-source publishing to deliver multiple versions of documentation for its Harmony and Storyboard Pro products, making them available as both PDF files and HTML5 Web content. In addition to topics, Toon Boom uses snippets, conditional tags, and tables of contents (TOCs) in Flare to customize existing content for different document versions. The Toon Boom team takes advantage of several other features in MadCap Flare to facilitate the development, design and delivery of content. With Flare, I can look at the entire index, get the big picture, and fix things immediately. It’s a night and day difference compared to using FrameMaker®. Meanwhile, MadCap Flare’s integration with Apache Subversion (SVN) for version control facilitates collaboration among different authors. “We can have multiple authors on the team work on the same project by producing documentation on SVN and then committing it to the same Flare project,” Ms. Chartrand explains. The ability to create different skins with Flare and publish them to different targets simply by setting output parameters provides another boost to productivity. More recently, Toon Boom has taken advantage of new functionality in MadCap Flare 11, which launched in spring 2015, in order to run documentation builds in the background. Since our Harmony 12 release, we have been making updates on our documentation weekly with Flare; we just rebuild it in the background and upload it. With FrameMaker®, we could not even consider that. Beyond improving productivity for authors, Toon Boom relies on features in MadCap Flare, such as drop-down text, context-sensitive Help, and mini component functionality to enhance the user experience. Additionally, the company uses MadCap Flare’s responsive design for its HTML5 output. As a result, no matter what computer or mobile device a customer is using, the Web content adjusts to the user’s behavior and environment based on screen size, platform, and orientation. In 2015, new functionality in MadCap Flare 11 has enabled Toon Boom to move away from the traditional tri-pane format of online Help sites to the top navigation format, which is not only optimized for search engines but also looks and feels like a modern website. As a result, the company has been able to create a familiar Web experience for users, as well as reinforce its branding with HTML5 Help that closely resembles the Toon Boom website. Before, we were getting flagged by Google for being non-responsive with our tri-pane Web output. Responsive output with Flare has helped us to improve our search engine optimization, and now our ranking has improved. Finally, Toon Boom relies on MadCap Flare’s built-in support for multi-language authoring, translation and publishing to produce all of its documentation in Japanese. Toon Boom continues to look at how the company can redefine its documentation using Madcap Flare to create a richer experience for users.